I meet Camilla and Rolf at an independent café on a weekday morning in Barcelona. Camilla is a 29 year old American who came to Barcelona as a student, and who stayed on so that she and Rolf could pursue their relationship. Rolf, a 27 year old Swedish man, had recently moved back to Barcelona from Sweden, and was working on his master’s thesis. The café is still quiet at this time, and we have the place almost to ourselves apart from the postman who stops in not long after we arrive for what seems to be his usual morning coffee. It’s a trendy café in the bohemian part of town, which Camilla tells me she likes. She often goes there, she says, as they have good WiFi and it’s not far from where she works. As we talk, the enormous, chrome coffee machine hisses brashly in the background, at times making it difficult to hear. 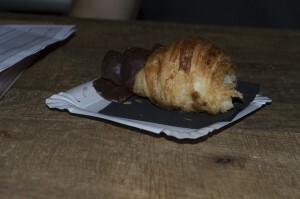 Rolf eats a croissant filled with Nutella, and we all sip our artisan coffees. While Rolf gets on with his much needed breakfast Camilla begins to recount some of the early part of their story. As she speaks she glances in his direction continually, as though to check that he agrees with what she’s saying. His chewing seems to go in time with reflective nodding, which indicates that he has no objections so far. Camilla’s glances at her boyfriend’s face soon become focussed on something more than agreement though, as unbeknownst to Rolf, the Nutella is slowly spreading itself around his mouth and beyond. She giggles. ‘You’ve got it everywhere’, she says in a gentle tone, laughing as she pulls a paper napkin from the holder to gently wipe it off. He tries to wipe it himself, but without a mirror he can’t see what he’s doing. She carries on with their story while she wipes, but the Nutella is still making its presence felt, ‘You’ve got chocolate here…it’s everywhere!’ she laughs. He laughs too ‘freaking Nutella’, he says. Camilla starts a sentence, ‘I just wanna..’ then hesitates, ‘A wet-wipe?’ I suggest. ‘Well, that, yeah. And I wanna lick it’, and I then I realise I may not be on the same wavelength. Camilla carries on with the story, but croissant devoured Rolf is free to ‘chip in at any time’ as Camilla suggests. So he does, ‘Well, that’s not entirely correct…’ he begins.